Jenna Fields, a 7th grader from Potomac, Maryland, was on bus patrol two years ago when she met Owen, an adorable blonde with Duchenne (see the towheaded photobomber in the pic!). 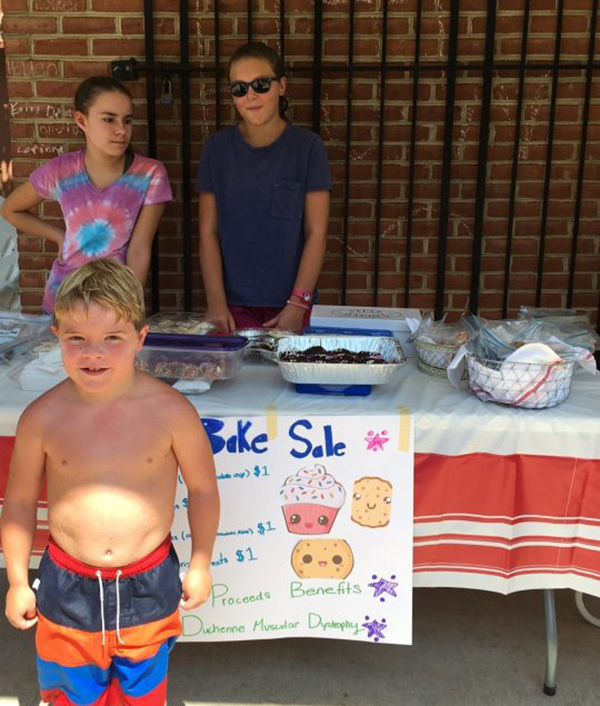 Over Labor Day weekend, Jenna (pictured in the sunglasses) held a bake sale at the neighborhood pool to help defeat Duchenne. To bring in customers, announcements were made via the community email listserve. Clearly a highly determined young entrepreneur, Jenna stuck it out all afternoon until she had sold every last homemade item. Thank you Jenna for feeding your town and supporting the research that will help Owen, Charley and all boys with Duchenne!